If you are dealing in a jewelry business, and want to showcase your collection in front of a vast audience, what’s better then starting your own jewelry website? Since jewelry is an expensive item, people want to be double sure before buying it. So, your physical presence along with virtual presence will motivate people to put their trust in your name. But virtual presence is possible through a website and coding it can give you a hard time. Jewelry WordPress themes provide you a pre-made template for creating a website. You simply have to drag and drop few images and text to get your website running. Then another advantage of using jewelry wordpress themes is you can set-up an actual e-store. A theme helps you in creating e-store with WooCommerce, collect payments with PayPal integration. There are a lot more aspects to look in a theme, like SEO friendliness (for better visibility on search engine ranking), a lot of page templates, gallery section etc. So, here we bring you the best Jewelry WordPress Themes that would help you start your digital journey. Before we start exploring these themes, here are few blogs of other WordPress themes that you might like to read. Now, let’s delve into the details of 5+Jewelry WordPress Themes. If you are a local jewelry designer that deals in handmade jewelry, this theme is for you. You can feature your collection of beautiful bracelets, neckpieces, earrings and other ornaments on the shopping page. Your visitors can go through these products and add their favorites to the shopping cart to purchase it later on.Then there’s WooCommerce integration, with it you can showcase product images along with the price tags and cart option. This theme is also integrated with the secured payment gateway – PayPal, which lets your buyers pay online for their purchase. Let’s take a look at some of its other amazing features. Get this beautiful theme for just $79 with lifetime support and free installation. 5 images Slider along with a space to add the image description. You will also find two buttons, through which you can add a direct link to your favorite pages like Shop Now or Contact Us. 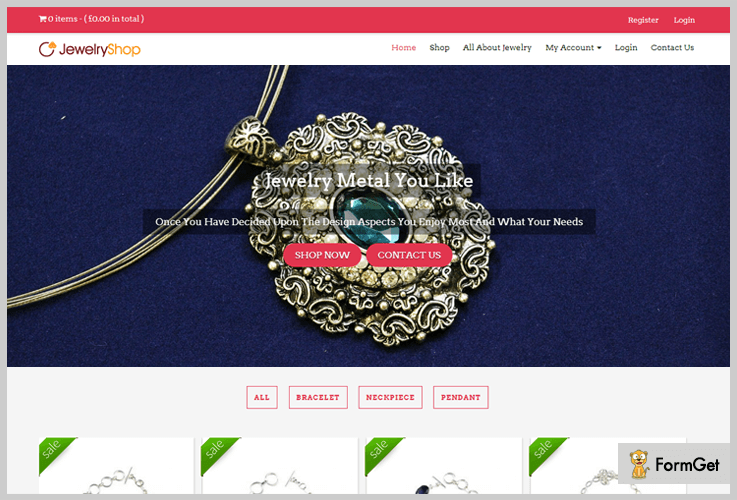 The JewelryShop WordPress theme includes a separate product page where you can list all your products. It also includes a sorting box via which your customers can easily locate their favorite item. A single product page is also available that lets your visitors view the detailed description of that particular product. A special blog section is also included so that you can share some jewelry facts with your visitors. This theme is available in 7 different color schemes. Do you deal in precious metals like gold and silver and want to showcase your beautiful jewelry designs to the world? 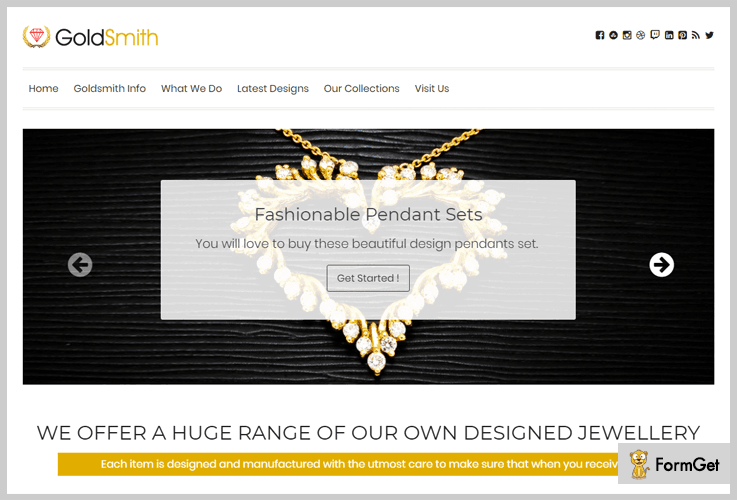 If yes, then GoldSmith is the best Jewelry WordPress Theme for you. This theme will let you feature your elegant collection of gold and silver products like earrings, neckpieces or heavy traditional ornaments in sliders, and gallery. You can also promote your other services like polishing, repairing, designing or jewelry cleaning with the help of 3 column service description area. Here are the other important features of the GoldSmith WordPress theme. Grab this theme just for $79 along with free installation and lifetime membership. 6 image slider with an option to add a description along with a button that lets your visitors land on a specific page. You can add images of your latest designs in the gallery page. It will let your customers easily navigate through your designs. You can post your thoughts about different areas of jewelry and share it with your visitors through the blogs section. You can also add a video describing your services in the videos section on home page. This theme also includes a special visit us page along with the integrated google map that will let your customers reach you out easily. Available in 7 unique color options. Nowadays, seashell ornaments like brooches, necklaces or cufflinks are getting very popular. If you are dealing with the similar kind of products, it’s the best time for you to create a website of yours to exhibit your items. 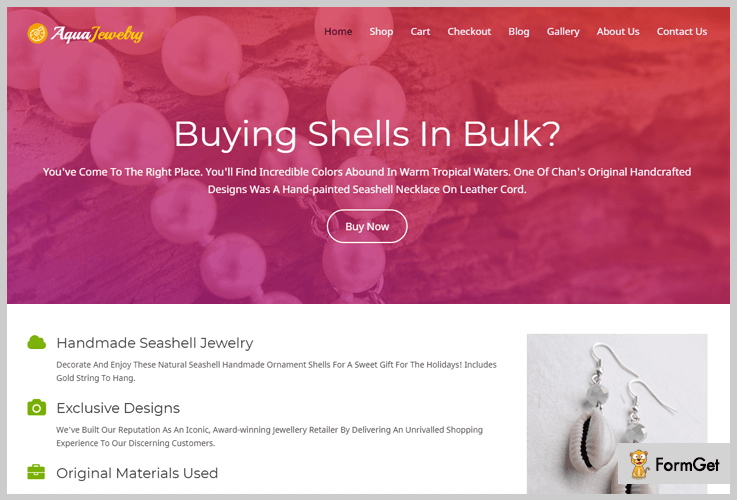 Aqua Jewelry WordPress Theme lets you easily get started with your website. It comes with a shopping page where you can list all your available products. Your visitors can view their desired products, add them to cart and pay for them online through the integrated payment system. A special product section is also available on the home page with an on-off feature. The theme also consists of a 4 column service area section where you can feature the variety of products that you deal in like bangles, earrings, bracelets or neckpieces. Get this theme for yourself at just $79. You will also get services like 24/7 support, lifetime membership, and 30-day money back guarantee. WooCommerce integration along with PayPal integration to convert website into an e-store. 6 images slider with a transition effect, where you can highlight any description along with the button to lead your visitors to your desired page. The theme also features the blog page where you can share the facts on seashell jewelry with your visitors. A gallery page is also available where you can showcase your designs. Aqua Jewelry also includes three column testimonial area where you can add the reviews of your customers. Special widget area in the footer and sidebar where you can include options such as search boxes, blog page, gallery page or contact details. You can add or remove the sidebar widget area as per your choice. An inbuilt about us and contact us page, which lets your visitors know more about you and contact you easily. 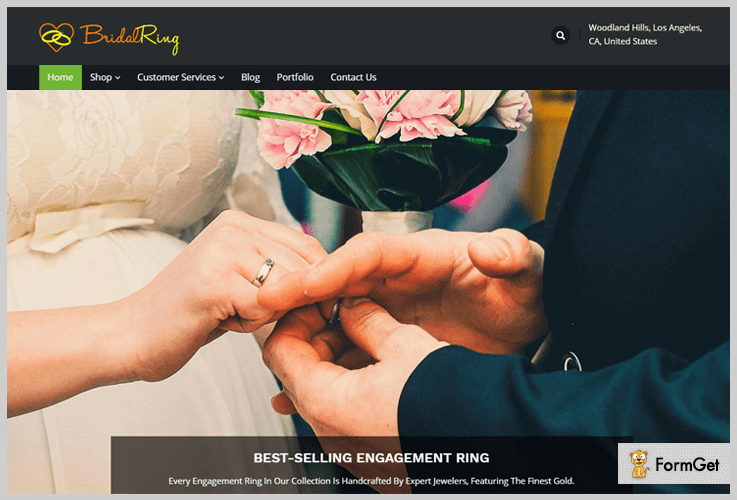 If you are dealing in engagement rings, and want to share your colossal collection through a website, this theme will perfectly suit you. The theme includes a special WooCommerce plugin that will easily let you sell your products with the add to cart option and an integrated payment gateway. This theme is available in unlimited color options so that you can design it according to your preference. 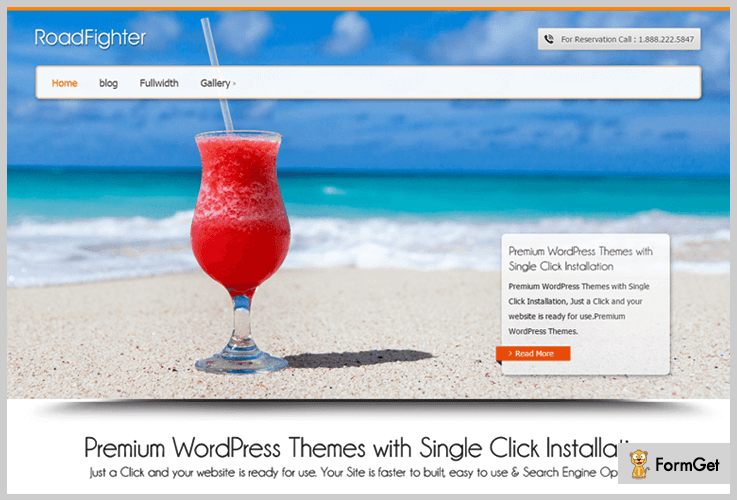 Pay just $79 and get this theme along with free installation, lifetime support and 30-day money back guarantee. This theme comes with a beautiful transition effect on the home page. Four Column product listing feature, where you can include your product categories like diamond engagement rings, couple gold rings or any platinum collection of engagement rings. The theme also includes a shopping page where all your beautiful collection can be listed. You can also add a detailed description of these products in the one product page. A Gallery section is also available where you can share the images of your latest collection. The BridalRing theme lets you share your thoughts on the perfect wedding rings or other related topics through its amazing blog section. Road Fighter is a free WordPress theme, with amazing features like full page slider and a fully customized homepage. You can change different sections of the page like service column, blog section, logos, background or intro texts as per your choice. As a jewelry seller, you can design your homepage with different backgrounds of beautiful ornaments or update your blog section with various facts about the jewelry. Download the Road Fighter WordPress Theme at no cost. The theme includes a special five widget areas. Three at the footer and two at sidebar. Includes a beautiful gallery with thumbnail images to exhibit your jewelry designs. The theme includes an optional one-column page template, that removes the sidebar. Local Business WordPress theme is a free WordPress theme that comes with many customization options. You can also adjust your page templates according to your interest. This theme also includes features like stylesheets for printing and a visual editor that lets you create jewelry blog posts of special styles. 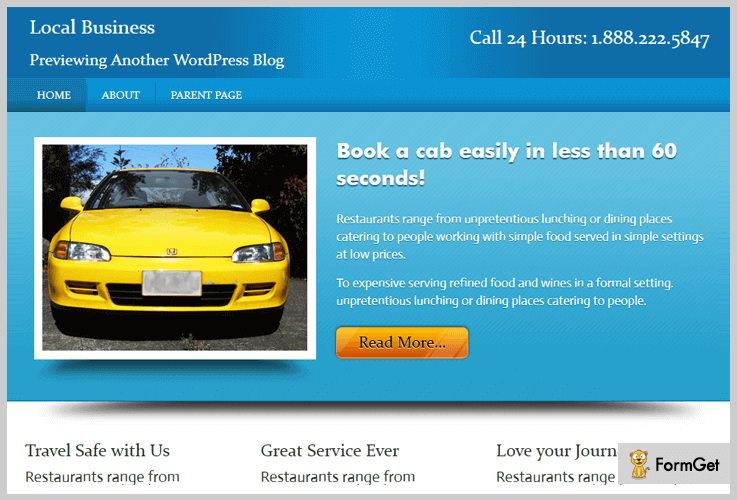 The Local Business WordPress Theme is available free of cost. Comes with a 5 widget area, 3 at footer and 2 at the sidebar. Easy to set up and install using the inbuilt options panel. These were some of the best Jewelry WordPress Themes that will help you start your online business easily. All these Jewelry WordPress Themes are highly responsive in nature so that you can use them in any of the modern devices. These themes are cross browser compatible as well so that you don’t find any difficulties while switching to your favorite browser. If you are really planning to take your jewelry business online, do go through all these themes.